The Pirate Cats have discovered a way to travel back in time and they are determined to change history. Professor Volt is a famous scientist who is able to track the activities of the Pirate Cats and knows when they are up to something. 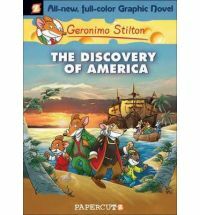 Using a time machine he invented he is able to send the Stilton’s – Geronimo, Thea, Trap, Benjamin and his friend Pandora back to stop the evil plots of the Bandit Cats.This time the Cats have set out to change the course of history by messing with the discovery of America. Will Geronimo and his family be able to stop the Bandit Cats in time for Columbus to discover America like he is supposed too? A different incarnation of the Geronimo books as this story is in graphic novel form. The story is still engaging and has little bits of actual history thrown in. It may be a little more difficult to read for younger readers with all the small panels. That may though make it a good choice for a child that can read but isn’t keen on reading novels, as it does introduce them to the characters from the novels and they will hopefully follow them into the other format.